What characterises a scientist journalist? (And related things.) Bora Zivkovic asks Am I A Science Journalist? and gets a good number of replies from those who blog, or write about science for a living. Greg Laden wrote a blog post in reply. In a related vein, Rob Kitchin from the National University of Ireland lays out his list of issues to those blogging (or thinking of blogging) from an academic setting. Myrmecos If you like photos of insects, check out Alex Wild’s blog, which tracks ’Alex’s exploration of insects and the other little creatures that run the planet.’ The illustration to the right is cropped from a photo on his blog. Open lab summissions In a recent list of submissions to Open Laboratory 2010, the annual publication of the best of blogging, I saw that someone has kindly submitted one of my own articles. You’re welcome to submit others that you think are a good read and will translate to print without too much editing. Check the list out, there’s plenty of good Sunday reading there. Don’t forget to look around sciblogs too! Football Word Cup In time for this event I have picked up a copy of Terry Pratchett’s Unseen Academicals. Don’t get me wrong, I love the game, but my coverage is limited to free-to-air television and most of the matches are only available on subscriber television. I’m off to sit in the sun (a luxury in winter!) and read it. I hope my readers’ Sundays are as relaxing! In fact, I should actually get round to finishing that post up. Yeah, I meant to mention that and clean forgot… sorry. 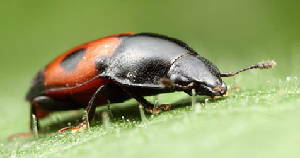 I love the leaf hairs in the photos, makes it look as if the beetle is foraging in a pasture. Alex is one of those guys that makes me feel very shy about even bothering to put my amateur photos on the web, he has some just stunning pics.